Grand Theft Auto V (GTA V) was announced on October 25th about two weeks ago and we got our first look at it on November 2nd just four days ago. While the trailer was very short and it seemed that it did not reveal much about the game, but if you looked closely enough, you would’ve found a lot of references to previous games in the series and you would’ve found out what to expect from the title when it releases next year. Still, even if you didn’t look closely enough, that won’t be an issue since we will analyze the most minute details after the jump. In case you were living under a rock for the past few years and don’t know what ‘GTA’ is, it is a very popular series of video games set in an open world sandbox environment. The first game was released in 1997 while the second was released in 1999. The series, however, only achieved true mainstream success when GTA III was launched in 2001 on the PlayStation 2. The game received universal critical acclaim and it has completely changed the very landscape of open world games and has, in one way or the other, changed the way games are designed today and will be in the future. The first trailer for the latest entry in the series – Grand Theft Auto V – was released on November 2nd . While it was quite short, it packed quite a few interesting details provided you know what to look for. The first thing you may have noticed is just how massive the map is and how Rockstar Games has packed so much detail into it. 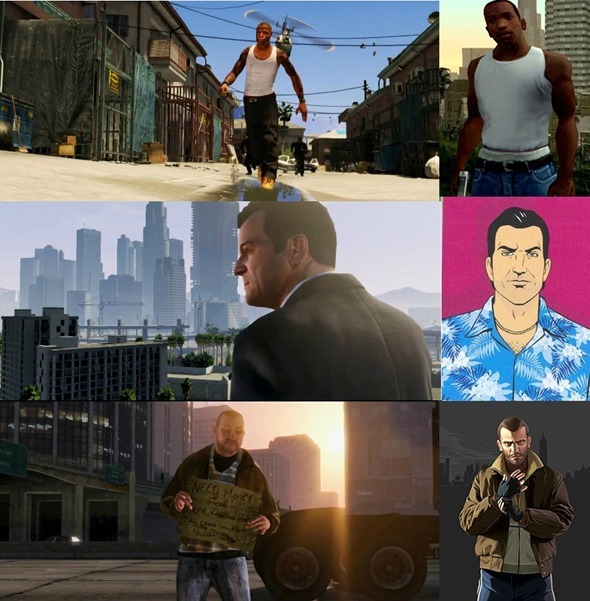 The game is based in Los Santos and its surrounding areas from Grand Theft Auto: San Andreas (2005). The trailer shows mountain ranges that you will most probably be able to climb and hopefully skydive off just like you used to in GTA: SA. Huge open ranges were also shown just waiting to be explored. The map has the now iconic GTA touch with all its lively NPCs and detailed environments. One of the bigger questions is, who is that guy who looks like Tommy Vercetti from GTA: Vice City? Well he is actually Tommy Vercetti, if reports are to be believed. About midway into the trailer, you can see an African American being chased by the police who, well, may just be Carl Johnson from GTA: San Andreas. Lastly, you may have noticed the beggar at 0:59 who looks like Niko Bellic from GTA IV which, we believe, is just Rockstar trolling its rabid fanbase. As far as gameplay is concerned, you will still have a sprawling city to play around in. Aeroplanes – which were sorely missing from GTA IV- are back and by the looks of it you’ll get to play around with a biplane, a Learjet and a fighter jet. Jet skis are also back (you can see one named Speedophile 2000 in the trailer). Gyms also make a return from GTA: San Andreas and you’ll be given the option to buff up your character (or fatten him up by not exercising regularly). Lastly, Rockstar seems to have seriously vamped up the graphics from GTA IV (which you can appreciate from the trailer). Hopefully this time around, they will optimize it better for the PC and ensure there won’t be any frame rate issues like there were on console versions of GTA IV. The Grand Theft Auto series takes a big jump forward in presentation, gameplay and scale with every numerically titled entry in the series. GTA III was the perfect transition of the open world sandbox gameplay from 2D to 3D. GTA IV pushed the series ahead in the presentation department and, if GTA V’s first trailer is anything to go by, we will see an even bigger jump in the graphics and gameplay department with GTA V.